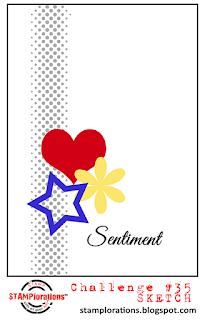 Hi everyone, I am sharing a card I made using a technique I found on Pinterest. You can see this beautiful card Here. 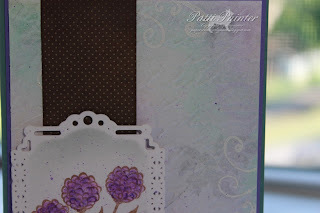 I have done a couple of practice runs and as of yet still have not made one that makes me as happy as her lovely card....but I will keep trying as I love this look. You use chalk pastels as a base, I chose pinks, yellow and green which I smeared with my fingers after putting the color down with the sticks. Then I off stamped a leaf image on copy paper to soften it before adding it to the background. Added a flourish stamped with Versamark, heat embossed with a fine detail embossing powder then a run through the Big shot with my Script folder finishes my background. Love the sketch this month at Stamplorations , they also have a Case challenge if that is more your style. Here are a couple of quick photos I took while in process and before putting my card together. 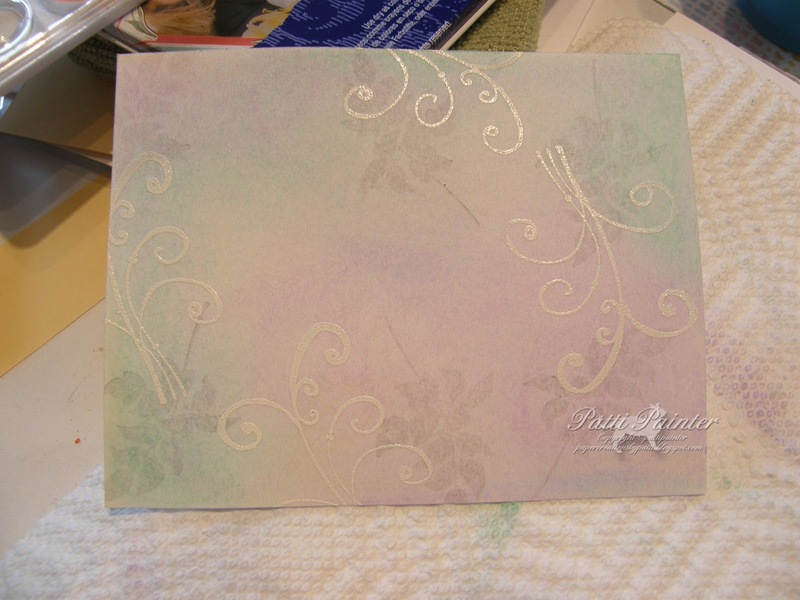 I think my embossing folder was a bit too busy but I still like it, just not perfect yet.....oh well, just an excuse to try again. Stop by Stamplorations and play along, I still don't have any of their stamps but I really need to order some, don't you think? Thanks for the visit and have a great week. So glad to see you posting your lovely creations again. I love everything about this card. The background turned out wonderfully and the stamping and colouring of the flowers is super. 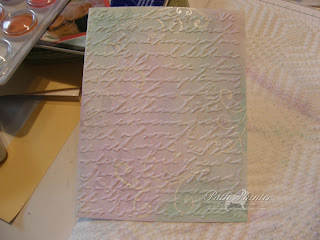 I got everything out to try the technique and then got distracted and did the embossing first - dah! I don't think you need to practice because I think you have already nailed it. 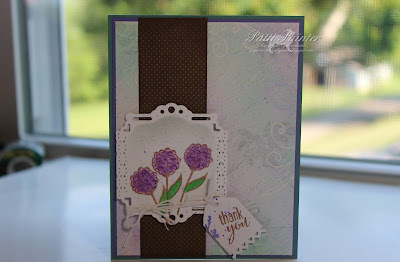 THANK YOU for playing along in the STAMPlorations sketch challenge. I can't wait to see what you design next! She's back, glad to see you crafting! Absolutely gorgeous as always!! Hello Patti, I was so happy to see a comment from you. I have stopped by several times but it looked like you were taking a vacation from card making. I'm happy to see you creating again too! I'm not sure why I don't get my email notification about my comments anymore...it must be because I have an older blogger version as I haven't wanted to update!!! Patti, this card and technique is gorgeous. I've been trying to learn new techniques but it's can be challenging for sure. I hope I start getting use to using stamps as I have way too many that I truly want to use. I will have to try your technique. Hope you are doing well! I always love seeing what you create. Thanks so much for stopping by. Great job with the bg! I think it looks really lovely. I like your simplified version of our sketch too. Very nice. Thanks for joining us at STAMPlorations! Such a gorgeous card! Your background is amazing! Thank you for sharing at STAMPlorations.